Assorted edible Indian plants. 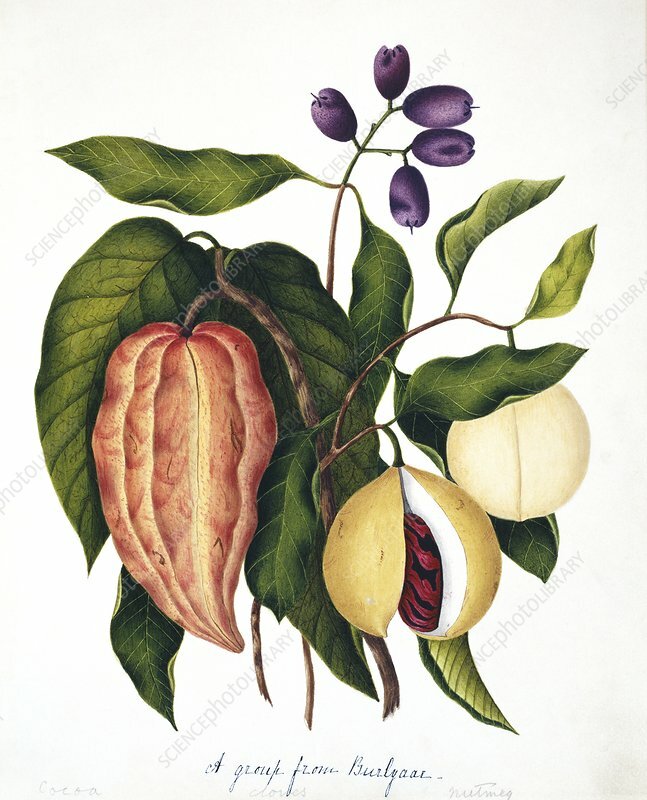 The three plants are the cocoa plant (Theobroma cacao, red pod), the clove plant (Syzygium aromaticum, purple fruit) and the nutmeg plant (Myristica moschata, red seeds in yellow casing). This watercolour is plate 1 from one of a set of three volumes by the Indian-born British artist and amateur ornithologist Margaret Bushby Lascelles Cockburn (1829-1928). These volumes, dating from 1858, consist of artworks of the people, flora and fauna of 19th-century India, particularly in and around the Nilgiri Hills (then known as the Neilgherry Hills) in the state of Tamil Nadu, in southern India.